Dan Morgan was the cornerstone of a Miami defense that led the way for the reemergence of the Hurricanes football program, and was the first college player in history to capture the 3 major national awards for defensive players. Not the place he expected to be when he signed on to join Miami, Dan was a Prep Star All American fullback at Taravella High School in Coral Springs, and didn't switch to linebacker until just days prior to the 1997 season opener. He would make that switch one of the keys to the Hurricanes defensive success to come. 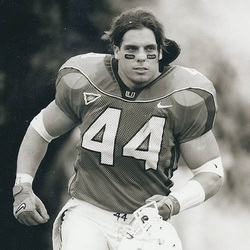 In 2000, Dan won the Butkus Award for the nation's top linebacker, the Bednarik Award for top defensive player, and the Nagurski Award as the College Defensive Player of the Year. He was also named a consensus First Team All American, named to 10 different squads, and was the unanimous selection as BIG EAST Defensive Player of the Year. He was a three time All BIG EAST first team selection, and even made the 2nd team his sophomore year, though he played most of the season with a broken thumb. Dan set the Miami career record for total tackles with 532 in his 4 seasons, including 309 solo tackles and 223 assists, both UM records. He led the team in tackles 3 of his 4 seasons. In 2000, he had 90 solo and 138 total tackles, including recording 20 total tackles twice, and at least 15 six times. His best game was a 21 total, 14 solo tackle effort against Virginia Tech in 1997. A first round selection (11th overall) by the Carolina Panthers in 2001 NFL draft, Dan played 7 seasons and was selected for one Pro Bowl (2004). He had one of the best defensive games ever in a Super Bowl when he had 18 total and 11 solo tackles in Super Bowl XXXVIII against New England. Dan graduated Miami with a Bachelor of Liberal Arts (BLA '01) degree, and currently lives in Charlotte with his wife, Ashleigh, and their three children; Lexi, Brady and Cali.